This set is a solo version of the newly revived Putsch project, now featuring Ronin and Freddy Frogs. It was recorded on 6th Dec 2012 as part of the Bad Sekta 7th birthday show on iLL FM. All drums, vocals, bass and breaks were sequenced and performed live on-the-spot using a Jazz Mutant Lemur, Novation Remote 25, Korg PadKontrol, Evolution UC33, Korg Nanopad2, Korg Nanokey. 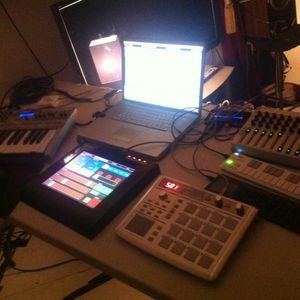 There is a massive Ableton project at the heart of it enabling the step sequencing, breakbeat re-arranging, quantised triggering and patch changes. We have a video of a rehearsal which we are gonna upload soon which explains our setup, for those with geeky inclinations. Putsch are currently taking bookings for weddings, bar mitzvahs, church fetes – and your rave! Contact myself or Freddy.